Wow. Up after 6 hours of sleep again. Seems as if I have to catch up on sleep back in Germany. This is really tough. Anyway, it's worth it. 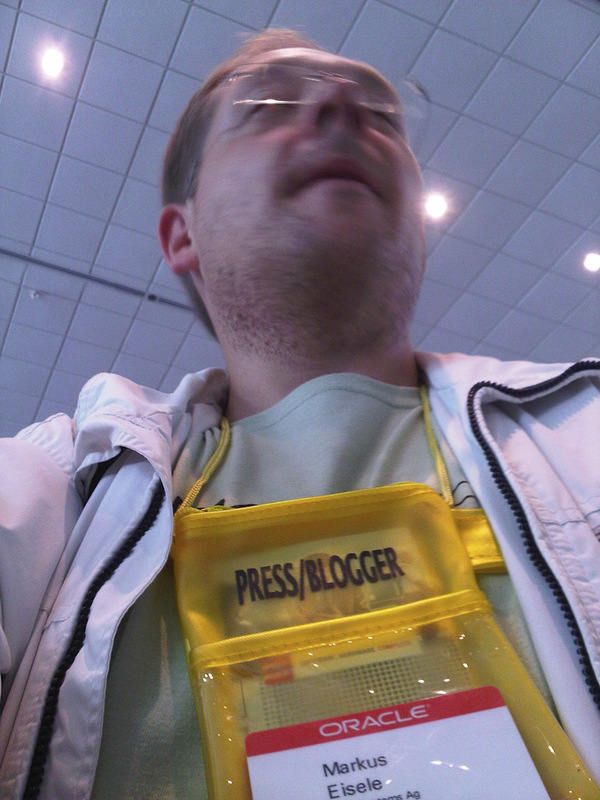 After the more or less successful check in I was heading to the GlassFish Community Event. Roughly 150 people there. Awesome to see all of the in one place. I ran into Alexis, Eduardo, John, Mike, Adam, Arun and many more. Thank you guys for finally meeting you! It was awesome. I even was mentioned on one of their slides: comment "he's giving us hard times" :) Lol. Loved it! It's a pleasure to help pushing things forward! Both John and Alexis presented about the roadmap and future plans. We even got something like a release date for the 3.1 (in inches at all :)) And everything sounds plausible. No big news at all. Everything around the GlassFish ecosystem is transparent and available already since some time. So, I did not expect any big surprises. It was nice to see Alexis doing some Screencasts on 3.1 features. The Oracle peers and managers were on site, too. Mostly in the background. I have met Mike a few days ago. 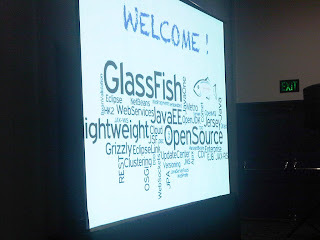 Still missing Adam Leftik who is the PM for GlassFish together with John Clingan. But I'll probably get a chance to catch up with him later the week. Today will be the first day full of sessions. Starting with a JDK talk, a little bit of product roadmap, onto JRockit and Virtualization visiting some JPA content in between. And finally the Java SE platform BOF and a WebLogic upcomming feature session. A packed day for me. Hopefully I will be able to get from one session to the other in time. Being at the hilton somehow feels disconnected to OpenWorld and the "big party" things. And having to go all to Nikko, Parc 55 and Hilton for some of the sessions really fragments the whole conference a lot. But let's see how all this is working out today. The pleasure was all mine! It was great to finally meet and have a chance to talk.